Jahangir Mahal or Jahangir’s Palace is situated inside the Agra Fort built by Akbar for his son Jahangir to serve as his private residence. However, it was mainly used as the principal zenana (palace for women belonging to the royal household) by the Rajput wives of Akbar and later, by Jahangir’s wife, Nur Jahan. This Mahal is one of the perfect examples of sixteenth century Mughal architecture. Made of red sandstone and white marble, it imbibes both Hindu and Islamic motifs into its exterior structures. 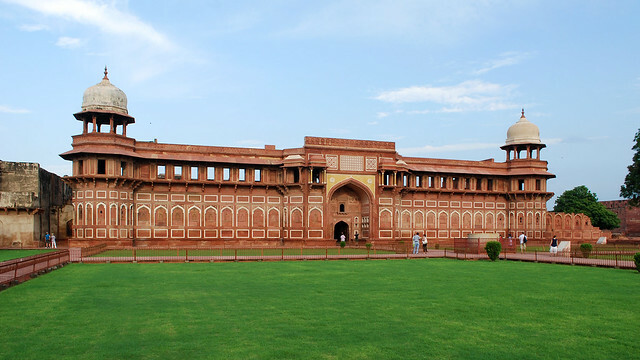 It is one of the 30 surviving architectural pieces of 550 buildings in Agra Fort. The Mahal still holds historical as well as architectural importance for its rare, sophisticated symmetrical designs and the diverse combination of different religious styles. Jahangir Mahal is one of the first buildings one gets to see, upon entering Agra Fort via Amar Singh Gate. An entrance fee of Rs 20 is charged for Indian citizens and Rs 300 for foreigners visiting the Mahal. It remains open daily from 6am to 5.30pm.